For qualified massage therapist wishing to offer traditional Thai Herbal Compress Massage. Be qualified to perform a traditional Thai Herbal Compress Massage treatment. Be able to use the different compresses to treat the body areas. Know the history and benefits of this traditional treatment. This is a fantastic course for qualified therapists wanting to offer their clients a deeper and more unique type of massage therapy without compromising their hands, wrists and body. Thai Herbal Compress Massage has been practised by Thai healers and Buddhist Monks since the 14th Century and is becoming a very popular treatment in western Spas. With its origins based within Thai Body massage, this exciting treatment has evolved into a luxurious Spa treatment. Thai Herbal Compress Massage is a wonderful therapy using warm herb filled compresses for a purely indulgent treatment. The herb balls (often referred to as herb dumplings), which are made in Thailand, are filled with a fantastic array of aromatic herbs for a variety of therapeutic purposes. These can help with ailments such as, stiff, sore or pulled muscles and ligaments, back pain, arthritis, chronic pain or injury, digestive dysfunction, migraines, and chronic stress or anxiety. The compresses used contain a blend of over 14 aromatic and therapeutic traditional Thai herbs to simultaneously achieve a relaxing and invigorating effect on the mind and body. The deeply relaxing penetrating heat from the compress soothes the aching muscles whilst the essential oils released from the herbs are absorbed by the skin relaxing muscles to allow joints to move more freely. On the course you will have the opportunity not only to give a full treatment but to receive one also, giving you’re an opportunity to learn how wonderful the treatment can be for your clients. The History and development of Thai Herbal Compress Massage. Guidelines to contraindications and cautions. Benefits and effects of Treatment. The Compresses used in the treatment. Step by Step procedure of a complete Thai Herbal Compress massage treatment. Entrance requirements: Students should hold a recognised qualification in Massage . Qualification / Certification: Upon successful completion of the course you will be awarded a ‘Thai Herbal Compress Massage Diploma’ by Helen McGuinness Health & Beauty Training International. CPD Points: Our Thai Herbal Compress Massage Diploma course accredited by the Beauty Guild, is worth 18 CPD (Continuing Professional Development) Points. Thai Herbal Massage Course Questions ? What other courses would you recommend once I have completed the Thai Herbal Compress Massage ? 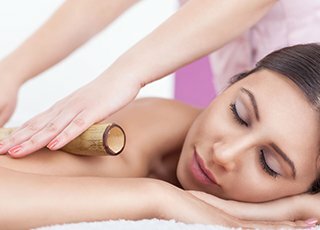 Why not increase your range of Massage skills with our Advanced Massage course, our Indian Head Massage Course, our Bamboo Massage Course and our Hot Stone Massage Course.